Damyan Baca, Sativa Tafoya and Justin Taul were all arrested after being found in stolen vehicles. 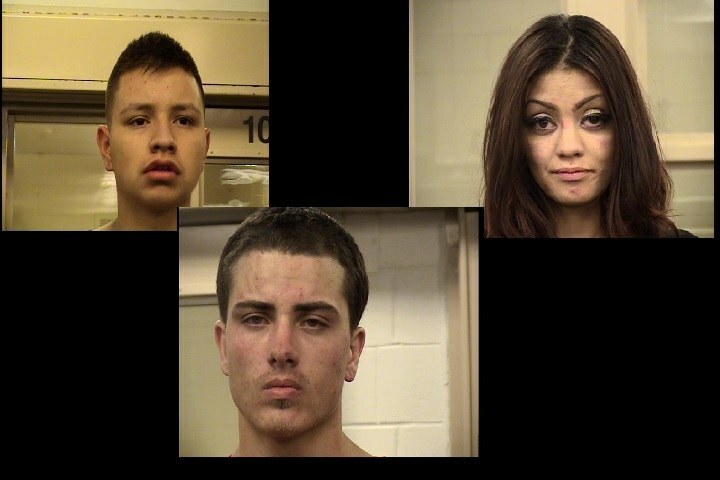 Daymen Baca, 21, Sativa Tafoya, 21, and Justin Taul, 21 were all arrested by police after being found in 2 stolen vehicles. On 02/16/17, an auto theft victim located her stolen vehicle in the 1600 block of Eubank Blvd. The victim called police and told them the vehicle was occupied and meeting with another vehicle. Based on the information the victim provided to police it was discovered both vehicles were showing as stolen vehicles by the license plates they displayed. Field Services Officers and Auto Theft detectives responded to the area. Air support was available and assisted with guiding officer to where the vehicles went once they went mobile. The Air Support unit was able to track both vehicles to the 1600 block of Glorietta NE where two subjects were immediately taken into custody after attempting to flee on foot. A third subject who also fled on foot ran into the neighborhood. A perimeter was set up and with the assistance of the K9 unit the suspect was apprehended a short time after. Damyan Baca was charged with Receiving/Transferring a Stolen Motor Vehicle, Possession of Burglary Tools, Possession of Meth and Receiving a Stolen Firearm. Sativa Tafoya was charged with Receiving/Transferring a Stolen Motor Vehicle. Justin Taul identified as a passenger in one of the stolen vehicles was located during the search and booked for a Felony Warrant. The Field Services officer, K9 Unit and Air Support Unit all worked together to take three auto theft offenders into custody safely and professionally. They did an outstanding job and were able to recover and return the stolen vehicles to their owners.